There are many ways that you can choose to improve your patio, especially when it comes to the floor. Should you install brick pavers, ceramic tile, or natural stone? There are many options to consider, but every good patio design in Alpharetta should actually begin with a stained concrete patio. These are the top 4 benefits of choosing to build a stained concrete patio. Unlike a wooden deck or brick paver deck, a stained concrete patio will resist the elements of sunlight, rain, drastic temperature variations, wind, and even ice. Just be sure not to let water settle on the concrete for a long time. Good patio installation should result in a completely flat patio with areas that allow for drainage into your yard. Standing water will ruin virtually anything. Stained concrete looks beautiful, a major improvement over ordinary concrete surfaces, and is durable enough to handle virtually anything you want to set atop it. That means that you can build an outdoor media room, a cool outdoor workout facility and yoga studio, a pool cabana just steps away from the water, breezy outdoor dining space, and so much more. It's inexpensive and easy to build a large patio hardscape, especially when you opt for stained concrete. Concrete is one of the cheapest building materials you can buy, and staining is particularly inexpensive too. Stone or brick patios can be on the pricier side, so much so that you may be tempted to install a very small patio to avoid breaking the bank. However, stained concrete is just as beautiful, but is much easier and cheaper to install. Therefore, you can get more square footage for your money, which means more livable square footage tacked on to your home. Your patio design should be a combination of inviting, stylish, and relaxing. Let the soft furniture take care of the inviting and relaxing parts. When it comes to style, the floor takes up the most visual space and is therefore the most important are of the patio. Thankfully, there are many unique ways to stain concrete, including levels of gloss, unique colors and textures, and many other options. 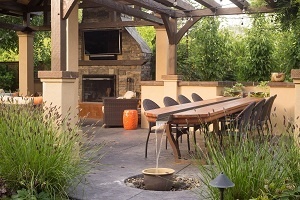 Personalizing your patio for a style that says "you" starts with a great concrete patio. If you're ready to experience these 4 benefits right in your own backyard, then don't hesitate. How do you get started on a beautiful stained concrete patio? You first step is to develop a unique and attractive patio design in Alpharetta with a talented team of hardscape professionals.